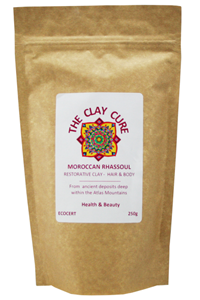 The Clay Cure Company Moroccan Rhassoul Restorative Clay possesses many remarkable properties. This mineral rich clay can reduce dryness, remove impurities, unblock pores, improve skin clarity and elasticity resulting in a general smoothing of the skin. 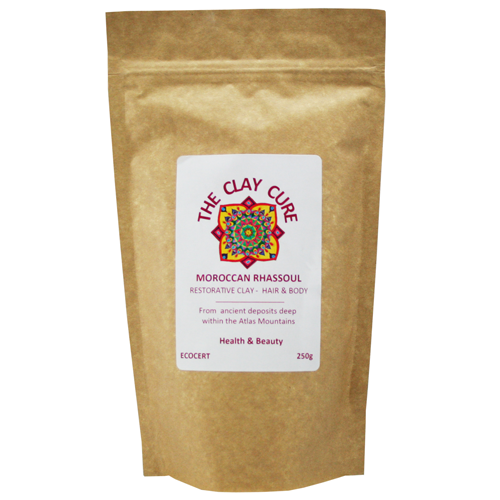 Moroccan Rhassoul clay can aid in the absorption of harmful substances, and help with detoxification due to a high rate of ion exchange. Rhassoul also has natural antimicrobial properties making it an effective treatment for the blemish prone. It can also be used as a scalp treatment to absorb oil, dirt, sebum and cleanse and clarify hair. The word Rhassoul is derived from the Arabic word Rhassala, meaning 'washing.' Moroccan women have used it for natural body care for over 1400 years. No natural beauty tool kit should be without this fabulous clay! Mix the desired quantity of Rhassoul in a bowl (no metal) then add warm spring water until it forms a paste. Apply to face, hair or body. Leave between 5 and 10 minutes before rinsing. You can also make a liquid paste and use as a shower gel. After washing, it is recommended to moisturise your skin.